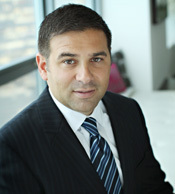 Craig Della Valle, MD, is a native of New York and received his undergraduate and medical degrees from the University of Pennsylvania in Philadelphia. He completed his residency at the Hospital for Joint Diseases in New York City. During his residency he spent a full year devoted to clinical and basic science research in the field of adult reconstructive surgery. Dr Della Valle completed a fellowship in adult reconstructive surgery at Rush-Presbyterian-St. Luke's Medical Center and Central DuPage Hospital, Chicago, Illinois. He is presently associate professor of orthopaedic surgery and director of the adult reconstructive fellowships at Rush University Medical Center in Chicago, Illinois. Dr Della Valle is a busy clinician who specializes in primary and revision total joint arthroplasty. A respected researcher, he has more than 80 peer-reviewed publications on topics including unicompartmental, primary, and revision total knee arthroplasty as well as total hip arthroplasty, hip resurfacing, and revision total hip arthroplasty. Dr Della Valle is a member of The Hip Society and The Knee Society and serves as a member of the board of directors for the American Association of Hip and Knee Surgeons. Recent accomplishments include co-authoring papers that received the 2009 American Association of Hip and Knee Surgeons' Clinical Research Award, the 2010 Knee Society Mark Coventry Award, the 2010 Knee Society Ranawat Award, the 2010 American Association of Hip and Knee Surgeons James A. Rand Award, the 2010 Hip Society Frank Stinchfield Award and the 2011 OREF/CCJR Award.